WASHINGTON, DC—(Laserfiche)—October 17, 2011—Laserfiche will today demonstrate its new iPhone app, Laserfiche Mobile™, at the ARMA International Conference & Expo (booth #527). When used in conjunction with Laserfiche Records Management Edition (RME), Laserfiche Mobile provides mobile content management within a secure DoD 5015.2-STD-certified environment. 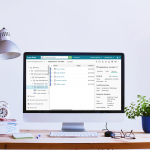 Laserfiche RME enables transparent records management, an approach that gives records managers the ability to create a secure file plan and manage retention schedules without interfering with any department’s line of business. Laserfiche Mobile is a robust app that enables you to keep all mobile content within your organization’s IT governance structure. Laserfiche Mobile, which includes a built-in demonstration, is available for free download from the Apple App Store.